Home Food Health and Food The Best Kale Smoothie Ever! 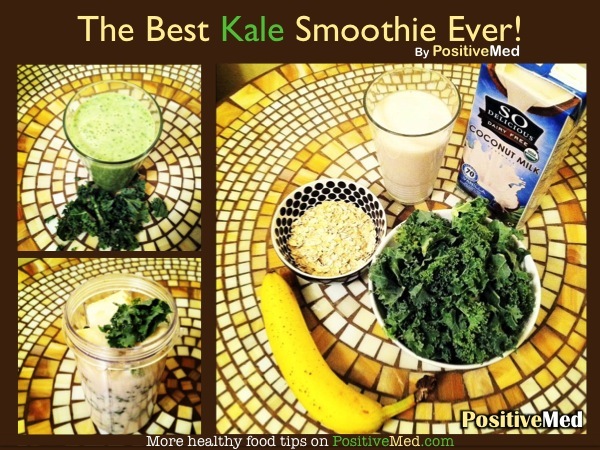 The Best Kale Smoothie Ever! This is one of the most delicious smoothies I’ve ever prepared, and it’s made from kale! Many of us don’t like the taste of raw kale, but this smoothie doesn’t taste like kale at all. Kale is a low-fat source of fiber, vitamins and minerals: One cup of chopped kale only contains around 33 calories; Kale is one of the top non-dairy sources of calcium (1 cup of chopped kale has around 100 mg of calcium). Also the same cup of kale has around 1 mg of iron, 33 mg of magnesium and 330 mg of potassium. Other than vitamin-D, kale is a good source of all vitamins, specially vitamin K and vitamin A. This smoothie is a good source of fiber, vitamins, and antioxidants. Because of its banana and kale, it’s also a mood-booster drink! If you try it once, I bet you’d love it forever! Enjoy! For some important tips to make a perfect smoothie, click here.